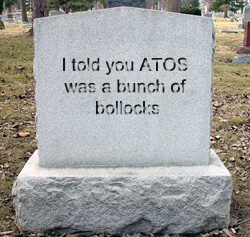 Inspired by Spike Milligan, and disgusted by Atos' treatment of disabled people, I created this yesterday. Anyone who knows about the Nazi's Disability Euthanasia Programme Action T4, will see unsettling parallels to what is happening to disabled people now. The current demonisation and persecuting of disabled people , the media hype over disabled people being burdens and scroungers, an ecomonic strain to society, is following the Nazi Euthansia's To Do list to the letter. I left my last job in April due to stress, which triggered psychosis and depression (which is one of the reasons this blog has been so neglected), and knew the letter from ATOS would be soon on its merry way. And it came, as you can see from the photo I took. Forget the polite language, how I recreated it is how I should have received it. Too many people see us through these lenses of false labels, which will magnify discrimation and hatred, while the person behind it shrinks. Fortunately - or unfortunately - I was actually psychotic when I filled in the atos form, and thought I was Jesus, and filled it in accordingly. Someone reassessed the form and decided I needn't go to the atos interview. Give it a few months and I will be asked again to go. 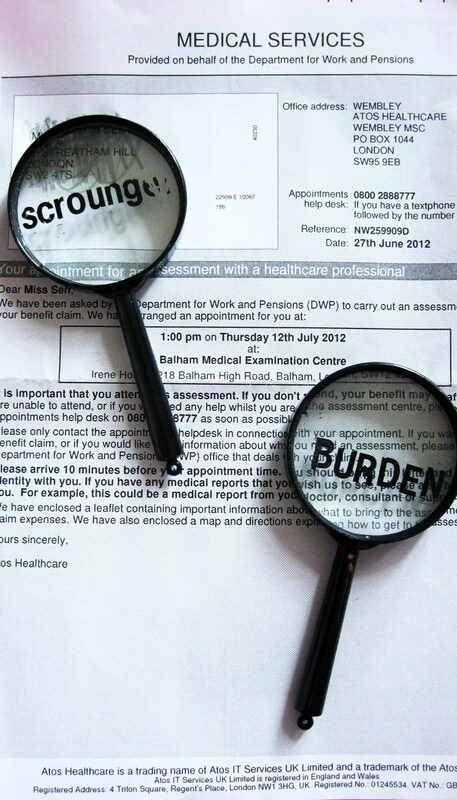 As stress is a trigger for psychosis, I may think I am Jesus again and try to cast the demon out of the atos assessor. Or heal the sick, who are the people who work there. Because despite over 1000 people being deemed fit to work dying after their assessment, according to atos and the government, there aren't any ill people about. Hold on a minute, maybe we have got it the wrong way round and atos are healing people through a patronising and demeaning interview. Why I have religious convictions when I am an agnotistic, I have no idea.